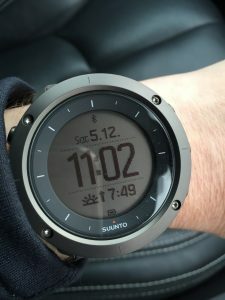 I was one of several people to have recently been invited by Suunto to test and review their new Suunto Traverse GPS watch. 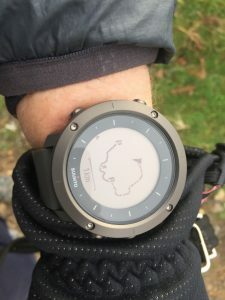 As a long term user of a Suunto Core that usually accompanies me on my outdoor adventures I was curious to see whether the addition of GPS in a watch was a worthwhile addition, or a compromise of size and battery-life. 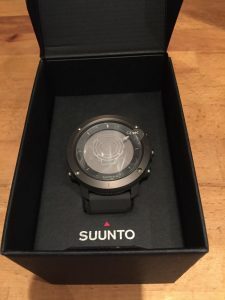 The Suunto Traverse arrived in smart packaging – not up to Apple’s impeccable standards – but typical Suunto. Unable to specify a preferred colour I received the graphite version which although looking darker in photos is actually a lightish grey which can sometimes have a brownish/green hint in certain light. It’s probably the most anonymous of the range which also includes black (with silver bevel), amber (which is dark grey with orange strap) and white. Out of the box I ignored the Quick-Start guide provided and dived straight in to the set-up process. The Traverse has a relatively straightforward menu system, using the right-hand side buttons for up/down/select navigation through the menus. Anyone with experience of previous Suunto watches will fee immediately at home, but it’s straightforward for new users too. Having an Apple Watch as my daily watch I quickly resisted the urge to tap on the screen and whizzed through the relatively simple menu. In fact I was slightly surprised that there weren’t more options/functions to bamboozle me, however here it’s evident that Suunto have purposely distilled the options and removed a number of the more specialist multi-sport functions that can be found on the Ambit. These are more aligned to training/althete needs (for a comprehensive review of the Ambit 3 take a look at the excellent DC Rainmaker website,whereas the Traverse is clearly a more focused outdoor activity watch. By adding GPS to the usual altimeter/baromter/compass functionality it delivers something akin to a Suunto Core on steroids. For me that’s a good thing as it includes the functions I’d find I need and are practical when hiking/climbing/exploring but without the bloat of functions I wouldn’t use. In common with a growing trend the Traverse also incorporates Bluetooth connectivity to you smartphone, allowing basic notification of messages/alert direct to your wrist. On the wrist the Traverse has a chunky and robust look – it fits rather well with the current fashion for over-size watches even if it’s size its out of necessity rather than design. The Traverse certainly feels robust without being engendered with excessive heft by a body that appears to be made of a sturdy composite and a stainless steel bevel. The rubbery strap appears similar to other Sunnto straps in terms of size/fit which suggests it would be simple to swap straps to suit your taste. I downloaded the Suunto Movescount app to my iPhone and completed a painless set-up and sync process. I wasn’t familiar with the Movescount portal but as well as being able to edit/control various watch settings, also allows you to log and share your activity/routes on a more social basis. it also allows you create routes and/or /POI’s and upload them to your watch. Battery life is a typical weak area for smartwatches – I currently have to charge my Apple Watch nightly – so I was unsure how the Suunto would fair. The USB charging lead has a spring-loaded calm to the side of the watch – I guess a plug-in connection would have made in more difficult to seal the unit – as it is, the watch is certified as waterproof to 100m. Leaving for work with the watch 100% charged I arrived home after a days use, including receiving many notifications, to find the battery at 96%. Obviously I wasn’t using GPS but even so thats a pretty impressive battery life. The specs show a 100hr battery life when using GPS so plenty for a long weekend adventure or backpack. 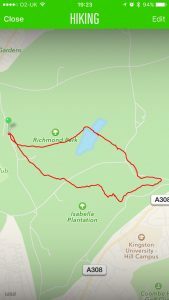 My first outing was due to be a trip to the Lakes last weekend but Storm Desmond had other ideas so I was limited to a meander around Richmond Park to give the Traverse its first outing. Starting a log was a simple press-and-hold affair and the watch confirmed a GPS fix almost immediately. 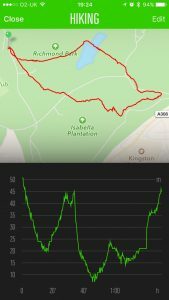 I’m used to the altimeter and compass functions of my Core but the use of GPS on the Traverse affords a rich array of trip data – distance, speed, pace, altitude, height gained/lost – with you able to customise the screen views to display the info you want. A breadcrumb display shows your route so far and a track-back options allows you to re-trace your steps. Adding a POI as you are moving is another simple case of press-hold a single button. At the end of the walk I sync’ed the watch to the Movescount app, whereupon my track was automatically uploaded. Within the app you are able to view a map view and several graphs with selectable metrics. Log-in to your Movescount account on a browser and you have the option to also export your GPX track to use with alternate software/services. You can also import or create tracks and upload them to the Traverse, though the Movescount app only includes Google mapping – if you wanted to use OS mapping for route-planning you would need to do that in another app and export the GPX track in order to import to your Movescount app and then onto your watch. In summary, my initial impressions of the Suunto Traverse are positive. It’s a definite step forward in terms of functionality from my battered old Core, and the addition of the GPS function adds usability without unduly compromising size or battery-life. Increasingly devices/hardware are being integrated with software services to deliver an overall ‘experience’ and the Suunto Traverse is fairly reliant on the Suunto Movescount service via app and web. 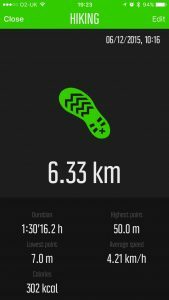 Thankfully Suunto’s Movescount app is pleasantly functional – it may not suit the power-user but it offers the basics in a user-friendly manner. OS mapping integration, allowing you to plot routes on OS mapping, would make it even better, particularity given the target market for the Traverse. Hopefully if the weather plays ball I’ll get chance to take it on a proper outing in the next few weeks.